Televangelist Pat Robertson recently made a gaffe. A gaffe, as journalist Michael Kinsley defined it, occurs when a political figure accidentally tells the truth. Robertson's truth is that America's drug war has failed and that the country should legalize marijuana. This view goes against the deepest political, moral and religious positions Robertson has held for decades, so imagine the blinding evidence that he has had to confront--and that has been mounting for years--on this topic. Robertson drew attention to one of the great scandals of American life. 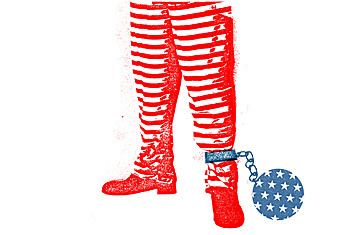 "Mass incarceration on a scale almost unexampled in human history is a fundamental fact of our country today," writes the New Yorker's Adam Gopnik. "Over all, there are now more people under 'correctional supervision' in America--more than 6 million--than were in the Gulag Archipelago under Stalin at its height." Is this hyperbole? Here are the facts. The U.S. has 760 prisoners per 100,000 citizens. That's not just many more than in most other developed countries but seven to 10 times as many. Japan has 63 per 100,000, Germany has 90, France has 96, South Korea has 97, and Britain--with a rate among the highest--has 153. Even developing countries that are well known for their crime problems have a third of U.S. numbers. Mexico has 208 prisoners per 100,000 citizens, and Brazil has 242. As Robertson pointed out on his TV show, The 700 Club, "We here in America make up 5% of the world's population but we make up 25% of the [world's] jailed prisoners." There is a temptation to look at this staggering difference in numbers and chalk it up to one more aspect of American exceptionalism. America is different, so the view goes, and it has always had a Wild West culture and a tough legal system. But the facts don't support the conventional wisdom. This wide gap between the U.S. and the rest of the world is relatively recent. In 1980 the U.S.'s prison population was about 150 per 100,000 adults. It has more than quadrupled since then. So something has happened in the past 30 years to push millions of Americans into prison. That something, of course, is the war on drugs. Drug convictions went from 15 inmates per 100,000 adults in 1980 to 148 in 1996, an almost tenfold increase. More than half of America's federal inmates today are in prison on drug convictions. In 2009 alone, 1.66 million Americans were arrested on drug charges, more than were arrested on assault or larceny charges. And 4 of 5 of those arrests were simply for possession.